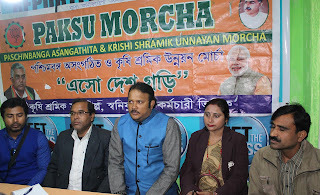 The Bhartiya Janata Party Trade Union known as Paschim Banga Asangathita and Krishi Shramik Unnayan Morcha (PAKCU MORCHA) today form a new committee here today. Annapurna Chaturvedi and Dinesh Chaudary have been made the convener of the PAKSU Morcha. Speaking with media person, the state president of PAKSU Morcha Dr. M Biswas said that BJP trade who have raised the voice of unorganized labours , drivers and other for their right now will fight for the right of same people of Hills. He added today two convener have been choosen will strengthen the organization here. "Many people are in contact with us here in Kalimpong and soon they will join our PAKSU morcha. He alleged TMC led State government of not implementing the Modi led Central Government schemes as those is yet to reach the grass roots level "
He said so instead of going via we want all the ones who are in unorgainsed sector to directly join the BJP trade Union. Bappi Paul the state secretary said we are working for providing security and fighting for the rights of the unorganized sector by demanding a minimum of Rs 500 wages. He informed very soon a program will be set in Kalimpong for those who want to join from different party in PAKSU Morcha. 0 Respones to "BJP new worker's union in Kalimpong"